Attractions In Amsterdam: What Are Interesting Amsterdam Highlights? What are the leading attractions in Amsterdam? This page covers the most popular Amsterdam tourist attractions, plus some Amsterdam highlights that don't get the publicity they deserve. Many of those who visit Amsterdam do so also for the experience of walking through its picturesque canals. There are approximately 165 canals in the city centre, crossed by over 1,200 bridges. The tall houses built on pillars dating from the Golden Age (17th century) are a testimony of the glorious past of the city. Some parts of the old city, such as the Old Church (situated in The Wallen, today's Red light district) for example, date back to the 13th century. Perhaps one of the best ways to see the canals is through a canal cruise. Besides the old canals they also include a tour though the harbour and usually last for one hour. Two main starting points are on Damrak, just outside the Central Station, and the area around the Leidseplein, respectively. and provide a great view too! A walk through Amsterdam's superbly preserved old city center is bound to be an enriching and relaxing experience. Most tourist attractions in Amsterdam are concentrated in this area, which only measures a few square miles. The old center comprises the area situated east of Damrak, where today's Red light district lies (known as de Wallen), the three concentric canal rings of the city, namely Herengracht, Keizersgracht and Prinsengracht (Grachtengordel in Dutch), the old Jewsih quarter of Waterlooplein and the Jordaan quarter with its many parallel canals. Throughout the old center you can admire the architectural styles of the 16th (Renaissance), 17th (Baroque) and 18th centuries (French-inspired Neo-gothic style). The buildings adjacent to the old center, built in the Art Deco style or bearing the features of the Amsterdam School also deserve a close look. A great way to explore the attractions in Amsterdam's city center is by bike or by walking. If you prefer the latter, your hotel is probably organizing guided walking tour. But why not do some research and make your own itinerary? 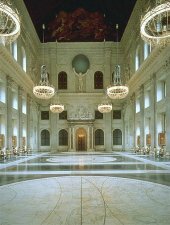 Situated on Dam Square, one of Amsterdam's landmarks, the Royal Palace (Koninklijk Paleis in Amsterdam, or Paleis op de Dam) is one of the newest additions on the list of historic buildings opened to the public, therefore one of leading attractions in Amsterdam. It has recently been reopened after a thorough renovation. The Royal Palace was built during the Golden Age (the 17th century) and has served as Amsterdam's City Hall before being transformed into the residence of Louis Napoleon who became King Louis of Holland I in 1806. From 1813 and until today it has been in the administration of the House of Orange. Today it's used by the Dutch Queen, Beatrix, as a venue for State Visits, official receptions and awards ceremonies. Among the many impressive features one can find a multitude of rooms lavishly decorated in distinct colors, official chambers such as one where the painter Rembrandt was declared bankrupt or the balcony where in the 17th century the death sentences but also weddings were announced to the crowds. The central part of the Palace, The Citizen's Hall, whose floor is covered by marble and decorated with three world maps is overlooked by a gigantesque statue of Atlas. 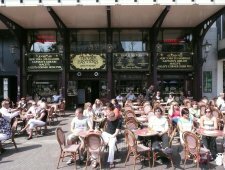 A tip: since it was closed for a long time, the palace is attracts a large flock of Amsterdammers as well as tourists. But you can avoid waiting lines by arriving not too long before closing times. Opening times: From June to August the Palace is open between 11.00 - 17.00 hours. From September to May it will be opened one hour later, between 12.00-17.00 hours (closed on Mondays). Admission fees: 7.50/adults, 6.50/Stadpas holders and Students. 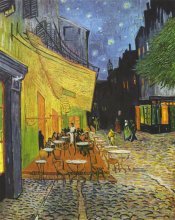 The Van Gogh Museum is world-renown for hosting the largest collection of paintings by Vincent Van Gogh, one of the most important 19th century artists. It's one of the most visited attractions in Amsterdam. The permanent collection comprising a number of 200 paintings, 500 drawings and 700 letters together with artist's collection of Japanese prints originally belonged to Theo van Gogh, Vincent's younger brother. Alongside with the permanent collection, the museum periodically exhibits temporary exhibitions. Opening times: The museum is located in the Museum Quarter and is open daily (except for January 1) between 10.00 and 18.00, and 22.00 on Fridays. Admission fees: 12.50/Adults, 2.50/13-17 years, 6,25/Stadpas holders and free for holders of I Amsterdam Card. A tip: buy your tickets online on the website of the museum in order to avoid the queues (which can be long). Another brand new addition to the city's cultural destinations, the Amsterdam branch of the Hermitage Museum is set to impress. It is situated in a newly renovated 17th century building on the bank of the river Amstel (Amstel 51) in a former Nursery Home. 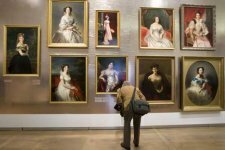 The inaugural exhibition, "At the Russian Court" includes a number of 1,800 items such as dresses and costumes, gifts received by the Tsars, paintings, weapons and photos and will be on display until the end of January 2010. From then on the museum will host two exhibitions a year. Opening times: The museum is open daily between 10.00 and 17.00, 20.00 on Wednesdays (except for January 1 and December 25). Admission fees: 15.00/adults, free for children up to 16 and holders of I Amsterdam Card. Shopping alongside the locals in Northern Market and Albert Cuyp Market can be an easy way to witness life in Amsterdam away from the beaten track. Situated in the Jordaan quarter, Noordenmarkt square owes its name to the Noorderkerk, a church built in the 17th century. Every Monday the square hosts a market of vintage clothes and antiques, and on Saturdays a recommended organic food market frequented by the culturally hip. The market can be best reached by walking along the canals from the Central Station. 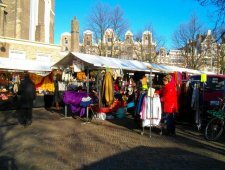 The Albert Cuyp Market is held six days a week on the Albert Cuypstraat in the Pijp area. It's famous for being one of the largest daytime markets in Europe and offers anything from flowers and fresh vegetables to cheap clothes and a spare tire for you bike. Despite being among the famous attractions in Amsterdam, many ordinary Amsterdammers shop here. It can be reached via tramways no. 4, 16, 24 and 25. Finally, the Flowermarket (Bloemenmarkt) is open in every season and is situated within walking distance from Muntplein, in its turn very well connected by tramway. These two squares boast a very large number of bars, pubs, clubs, coffeeshops, street artists and restaurants and make for the liveliest tourist attractions in Amsterdam. While Leidseplein and the adjacent streets are packed with terraces, pubs and ethnic restaurants, Rembrandtplein is the place where famous clubs such as Escape, Studio 80 and Club Rain are located. However, one should not miss the club Sugarfactory and concert venues Melkweg and Paradiso, all found in the vicinity of Leidseplein. Both squares are well connected by several trams and night buses. These two shopping streets situated within walking distance from Central Station, host a very diverse range of stores selling from clothes to outdoor sports, antique shops, restaurants, brasseries, coffee shops, bakeries and a movie theater. One of the lesser visited attractions in Amsterdam, this ancient brewery, organic beer is still brewed in a traditional way. Along with the six assortments of beer that can be found all year round, there are several seasonal beers on offer. The location is very picturesque as the brewery is hosted by one of Amsterdam's landmarks, namely "De Gooyer", the highest wooden windmill in the country. The Brouwerij aan 't IJ (Funenkade 7) can be reached by tram no 10 and 14. Want to discover more attractions in Amsterdam? 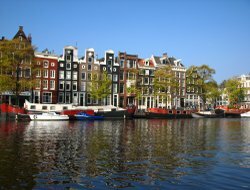 See our pages about Amsterdam attractions and tourist attractions in Amsterdam. 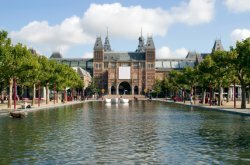 Which Amsterdam museums are must-see? What's the deal about the Amsterdam red light district?